The 1TB Aegis Padlock Encrypted USB 3.0 Hard Drive with PIN Access from Apricorn helps to provide advanced security measures within a compact form factor. 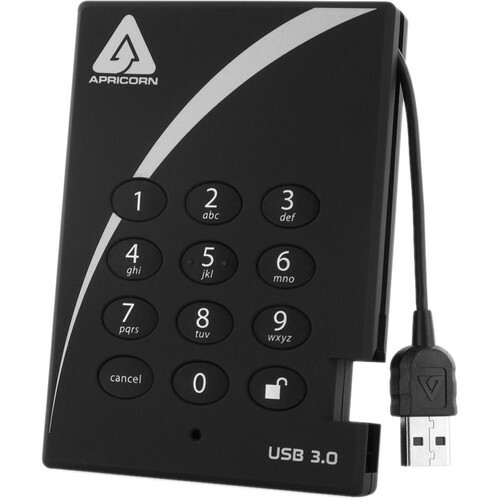 Designed with a 1TB capacity and a USB 3.0 connection, it features military-grade FIPS PUB 197 encryption and 256-bit AES-XTS encryption. Its keypad allows the drive to be accessed using a unique PIN, while the drive is further protected using drive reset and auto-lock features, as well as Brute Force Self-Destruct, Variable Timing Circuit (VTC) technology, and a wear resistant keypad. This drive is further protected from physical attacks using a tough epoxy coating, while a wear resistant keypad helps hide key usage from potential hackers. This drive operates using USB bus power and is compatible with most operating systems, including Windows, Mac, and Linux. While it is USB 3.0 compatible, it is also compatible with USB 2.0 and 1.1. The Aegis Padlock is protected by a limited 3-year warranty and includes an integrated USB 3.0 cable, a travel pouch, and a Y-auxiliary USB 3.0 power cable. The Y-auxiliary cable helps to provide power by utilizing two USB ports when one port is not sufficient. Box Dimensions (LxWxH) 8.2 x 6.3 x 2.8"
1TB Aegis Padlock Encrypted USB 3.1 Gen 1 Hard Drive with PIN Access is rated 4.7 out of 5 by 3. Rated 5 out of 5 by Anonymous from Excellent product! The Aegis Padlock is very easy to set up and use. A quick and simple process allows the user to reset the default PIN/code (i.e., 123456) with a 6-digit PIN of one's choosing. After that was done, the device has been performing flawlessly for me. It starts up quickly and data transfer is very fast. Rated 4 out of 5 by Christian H W. from True Plug and Play! Worked exceptionally well - read the instructions, plugged it into my Mac, changes the master password and it works like a dream. Only reason for not giving 5 stars is that the carry bag is a touch too small to accommodate the extension USB-3 cable that comes with the disk. Rated 5 out of 5 by Darlin' Clementine from Great product I needed to store confidential personal information securely and this product fits the bill. Great product.